The DEWALT DCB205CK kit keeps your power tools running and productive. 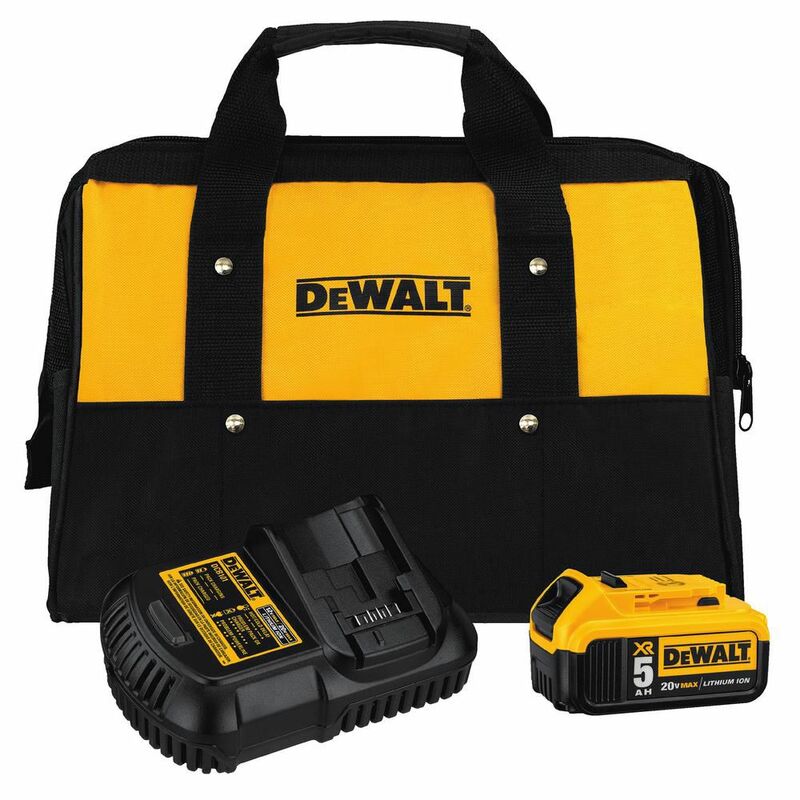 The battery and charger are compatible with the entire line of DEWALT 20V MAX tools and accessories. Bosch provides innovative professional power tools that meet the highest standards in speed, precision, and durability which allow the user to achieve great work results. Specializing in the most light weight and compact tools, Bosch 12 V Max tools are designed for easy use while still packing enough power for the job. To guard against overheating, overload and unnecessary discharge, the Bosch 12 V Lithium-Ion batteries include electronic cell protection (ECP); increasing the life of the battery and tool. Bosch 12 V Max tools come with the PROVANTAGE three-year protection plan, which guarantees two years of battery protection and one year of tool protection. Under this plan, you can receive two years of free battery replacements, tool replacement for one year, and a free tool repair package for the second and third years. Our 20V MAX 3.0 Ah Compact Battery provides reliable power and long battery life. Using the latest lithium ion technology, it offers 3 Ah capacity with minimal weight, offering ergonomic benefits for extended power tool use. A 3-LED Fuel Gauge system allows instant battery status checks. This battery is compatible with all DEWALT 20V MAX* power tools and includes 3-Year Limited Warranty. The ECHO 58V Lithium-Ion Charger is the most advanced, professional grade high voltage cordless Charger in the industry. Featuring innovative charging technology, this charger is equipped to protect and extend the life of the battery. With a 30 Minute or 1 hour recharge time, users can complete big jobs without worrying about running out of power. The ECHO Lithium-Ion Charger is backed by an industry-leading 90-day money-back guarantee, a 5-year consumer warranty and a 2-year commercial warranty. 20V MAX XR Lithium-Ion Starter Kit with 5.0 Ah Battery, Charger and Bag The DEWALT DCB205CK kit keeps your power tools running and productive. The battery and charger are compatible with the entire line of DEWALT 20V MAX tools and accessories. 20V MAX XR Lithium-Ion Starter Kit with 5.0 Ah Battery, Charger and Bag is rated 4.8 out of 5 by 98. Rated 5 out of 5 by Bob from Great impact wrench, and great price. Home Depot has... Great impact wrench, and great price. Home Depot has some great tool prices. Tool is great for lug nuts is not as aggressive as air wrench but still as strong. Rated 4 out of 5 by Francis from This grease gun is easy to use and reload.... This grease gun is easy to use and reload. Rated 5 out of 5 by Steven from Was exactly what I was expecting you can’t go... Was exactly what I was expecting you can’t go wrong with Dewalt and Home Depot shipping is more than fast enough for me. Rated 5 out of 5 by Jsun from Great kit Charges fine with a long lasting battery and carry bag. What model is the charger that is included in this kit? DCB115? The included charger is a DCB101. Hi just add it your cart and it will automatically be added to the cart for $0 dollars as a gift.